I've been on a bit of a nut kick lately. I blame the granola that's been made and the fact that I'm trying to get a lot more healthy fats in my life right now. This. This right here? This is some magical stuff, I tell you. And a total nod to my childhood as well. As a child (ahem and adult) I've loved ice cream. I mean... who doesn't? Two of my families favorites were Chubby Hubby and Chunky Monkey. The Chunky Monkey flavor is a banana ice cream base with pieces of chocolate and walnuts all through it. So, being as I'm so nutty right now... I figured I'd take those flavors that I loved and turn them into a snack trail mix! 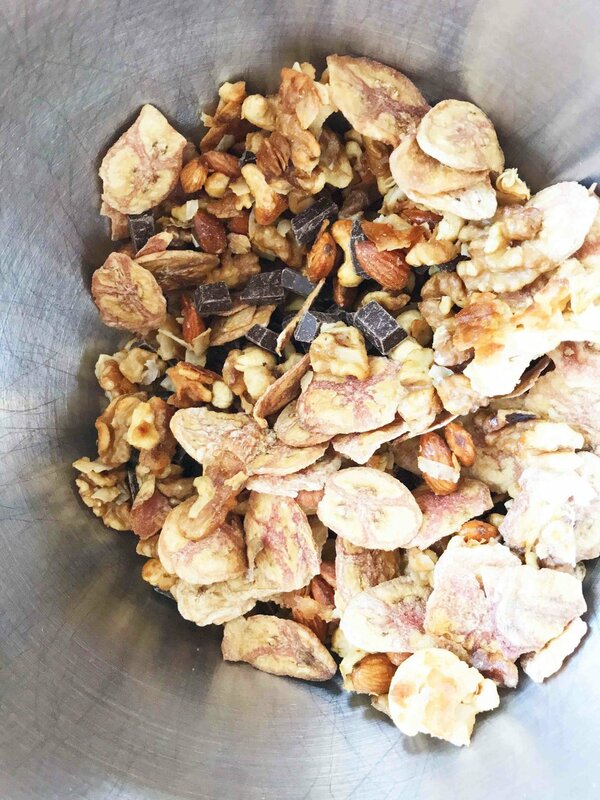 This trail mix is made with just a few simple ingredients. Nuts. Chocolate. Bananas. Annnd just a touch of coconut flakes. It's all baked (well... the chocolate isn't) and then combined together to make one bunch of perfect snack time goodness. All the nuts used here were raw. You don't want to use roasted, salted, or otherwise. Just the shelled nuts. It's also important to use BIG and UNSWEETENED coconut flakes. The banana chips also should be bare and unsweetened. Just plain jane dried banana slices. Trust me. The recipe is what will add all the sweetness that's needed. Snack away lovelies. Snack away. 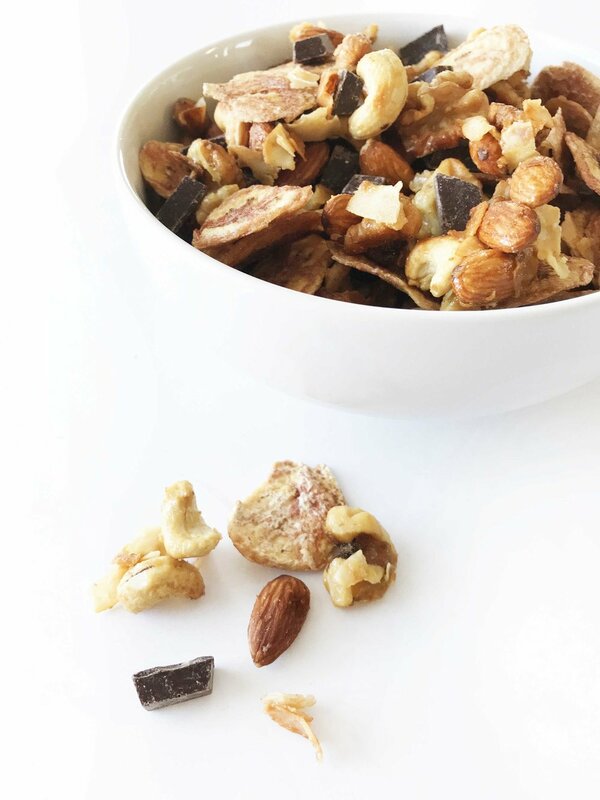 This Chunky Monkey Trail Mix is sure to curb those cravings in a more wholesome way. It's great to have on hand and lasts in the pantry for at least a couple of weeks. And feel free to make this your own, using whatever nuts might suit your desires. Preheat the oven to 350 degrees F. and place foil or a silicone mat on a baking sheet; set aside. In a large bowl, mix together the 2 C. Raw Walnuts, 1 C. BIG Coconut Flakes, 1/2 C. Whole Raw Almonds, 1/2 C. Whole Raw Cashews, 1/4 C. Honey, 1 Tbsp. Melted Coconut Butter, and 1 Tsp. Vanilla Extract until well combined. Transfer to the prepared baking sheet and spread it all out a bit. Place in the oven to bake for 10-15 minutes or until the coconut flakes are starting to brown and the nuts are fragrant. Once done, remove from the oven and set aside to cool completely. 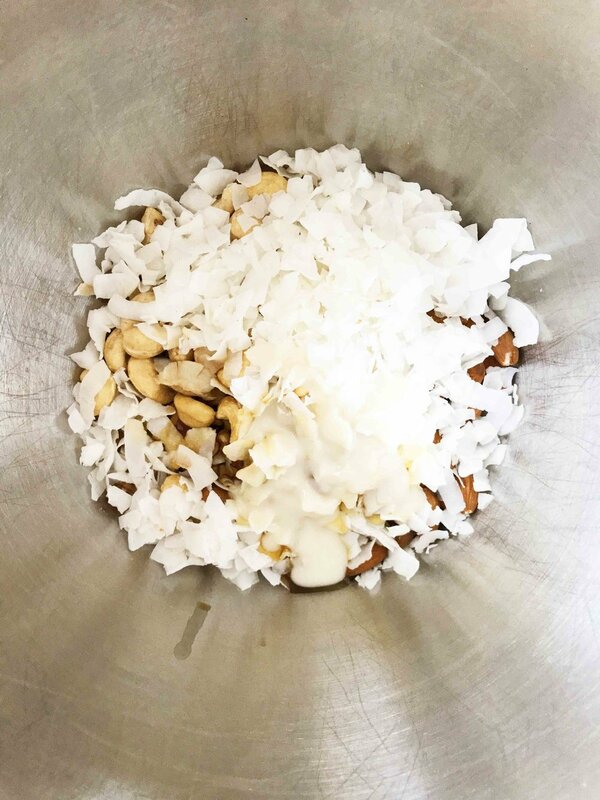 When cooled off entirely, transfer the nuts and coconut mixture to another large bowl and mix together with the 6 Oz. Unsweetened Banana Chips and 1/2 C. Dark Chocolate Chunks. Enjoy right away or store in an air-tight container.